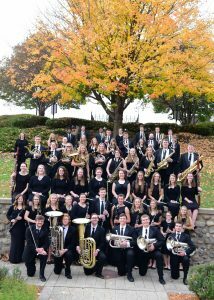 The Martin Luther College Wind Symphony, together with members of the Wisconsin Lutheran College Band, will present Whatsoever Things: A Sacred Concert for Wind Band in the Chapel of the Christ. Works on the program include Eternal Father, Strong to Save by Claude T. Smith; How Deep the Father’s Love for Us by Anthony LaBounty, based on a English hymn tune; Cathedrals by Kathryn Salfelder, a uniquely antiphonal work inspired by the compositions of Gabrieli; and Whatsoever Things by Mark Camphouse. The Martin Luther College Chorale, Mannerchör, and Women’s Choir will also join us in a setting of The King of Love My Shepherd Is. The finale of the concert will be a joint performance of With Heart and Voice by David Gillingham. Please join us for this concert of praise!